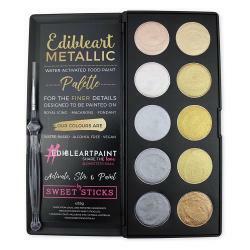 Edible Art Metallic Water Activate Food Paint Palette by Sweet Sticks is the first of its kind. Designed for the finer details in cake and cookie decorating. It is specifically formulated to cater for the Vegan and Religious Decorators.With a unique blend of 100% edible ingredients they can paint, dry and be rub free on many surfaces making decorating quicker, easier and more effective.